CryptSync is a cool freeware app which helps with encryption while synchronizing data with online cloud services like Google Drive, Microsoft OneDrive and DropBox. 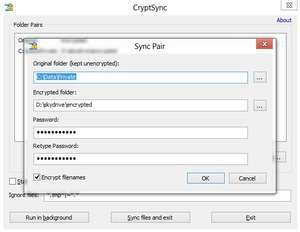 With CryptSync, you can define two folders on your computer. The destination folder will thus be encrypted meaning the contents are relatively safe from hackers or government agencies wishing to spy on you and your data. The program utilizes AES 256-bit encryption and creates 7-Zip 7Z archives. Version 1.2.7.338 is a freeware program which does not have restrictions and it's free so it doesn't cost anything. For security reasons, you should also check out the CryptSync download at LO4D.com which includes virus and malware tests. Additional screenshots of this application download may be available, too. CryptSync download been highly rated by our users.